The MELAdes disinfectant system is ideal for practice and clinic use, providing high-quality at an affordable price. The aligned products guarantee the reliable disinfection of hands, surfaces, instruments and drill bits. The products of the MELAdes series are powerful against viruses, gentle with surfaces and skin. Gentle and effective. MELAdes 600 for the effective disinfection of hands and forearms can be perfectly integrated in the working processes of medical practices or clinics. Strong against viruses whilst protecting work surfaces and skin. The aldehyde-free composition of MELAdes 700 is excellently-suited to the cleaning and disinfection of alcohol-resistant equipment and surfaces. MELAdes 800 cleans, disinfects and protects the instruments from corrosion and protein fixation, thanks to its gentle aldehyde and phenol-free composition. A reliable, ready-to-use combination product. Especially developed for the cleaning and disinfection of dental drill bits, MELAdes 801 guarantees the best-possible cleaning power and effective protection against corrosion. The easy-to-use wall dispenser for MELAdes 600 hand disinfectant. With its long lever and compact structure, this compact wall dispenser makes for hygienic operation and fits perfectly into the practice concept. With its 3 litre volume, the MELAG instrument bath is a practical and durable aid for the application of strong disinfectants in a practice and clinic setting. Disinfection is a process which reduces the number of micro-organisms capable of reproduction by a factor of 100,000, guaranteeing a low-germ state. The irreversible inactivation of all pathogens (fungi, bacteria and viruses) means that disinfected areas (e.g. work surfaces, skin or instruments) no longer constitute an immediate danger of infection. A top-quality disinfectant for safety and affordability. The MELAG hygiene system: effective against micro-organisms. The range of products provided by the MELAdes series is efficiently applicable for every area of operation. The MELAdes series provides disinfectants for hands, surfaces, instruments and drill bits. The following section outlines the advantages of the four MELAG product categories. The following section outlines the advantages of the four MELAG product categories. MELAdes 600 is a ready-to-use, alcohol-based, perfume-free disinfectant for application on skin and hands. Its excellent skin-tolerance and activity spectrum have been especially adapted to the needs of medical and dental practices. The recipe of MELAdes 600 does not contain any cumulating long-term active ingredients or any other additives. MELAdes 600 has been dermatologically-tested and is especially suitable for those with allergies and sensitive skin. Find out about MELAdes 600 for hand disinfection. MELAdes 700 is a quick-acting disinfectant for work surfaces and other surfaces. Containing state-of-the-art active agents, its recipe guarantees a very high level of application comfort. With a pleasantly fresh odour, MELAdes 700 has a powerful impact on micro-organisms whilst protecting your practice and clinic surfaces. The aldehyde-free composition of the MELAdes 700 rules out discolouration almost completely. Its composition has been aligned to the needs of the surfaces of MELAG steam sterilizers and washer-disinfectors. This makes the quick surface disinfectant especially suitable for use in your decontamination room. Find out about MELAdes 700 for surface disinfection. MELAdes 800 is a non-destructive, active instrument disinfection agent. 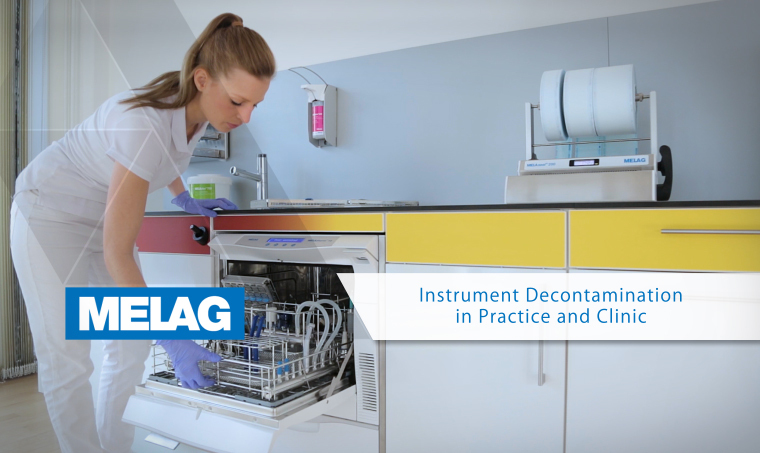 Free of aldehyde and phenol, the concentrate permits optimal manual cleaning and disinfection of the instruments in a single work step. Not containing aldehyde, it avoids protein fixing, thereby complying with international hygiene guidelines for instrument decontamination. MELAdes 800 is used in an immersion bath procedure (disinfection tray or ultrasound bath) performed in a practice or clinic context. Find out about MELAdes 800 MELAdes 800 for instrument disinfection. MELAdes 801 is a ready-to-use combination product for the cleaning and disinfection of dental drill bits and other rotating precision instruments. Its excellent material-friendly properties it especially suitable for sensitive instruments such as aluminium drill bits, rubber polishers and diamond points. The drill bit disinfectant provides excellent cleaning; the corrosion inhibitors make it for optimal instrument protection. The MELAdes 801 ready-to-use solution can be used directly in a bur bath or an ultrasound bath. Find out about MELAdes 801 for drill bit disinfection.